My wake up location this morning was in BLM land in Lake Havasu City. I was able to get here after flying from Seattle to Las Vegas and driving for about 2,5 hours south. I met my goal of driving to my nightly spot and getting here before night fell. 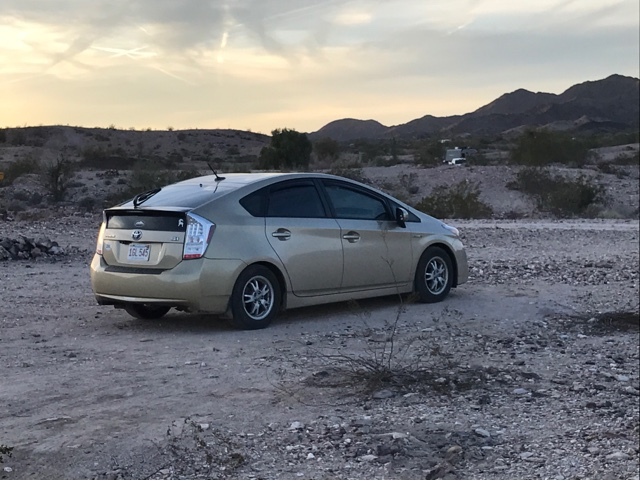 Although I know this area, there are left over stone rings for fireplaces and ruts/washes that are not friendly to a low clearance vehicle like my Prius. 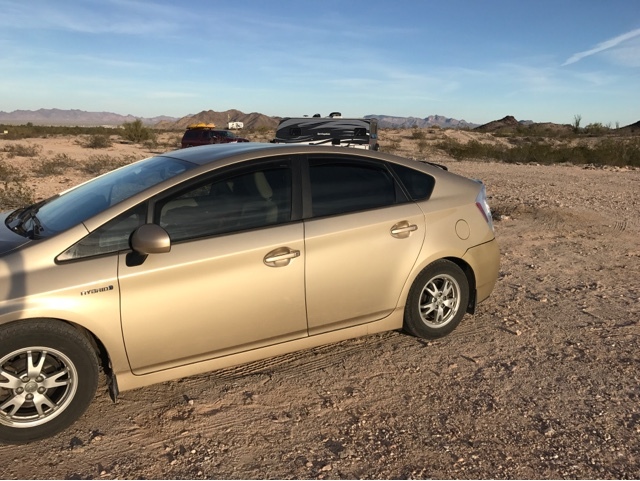 In order to fly to Seattle and spend the weekend up north I had to shut down my fridge while my Prius was parked 5 days at the Las Vegas Airport. That means that anything that could spoil was eaten or had to be trashed right there at the airport. I did a good job of planning to use the last of the food from the fridge but had a Walmart bag that did get trashed before boarding the plane. That meant that this morning I needed to visit the Havasu Walmart to restock some supplies before arriving at my next destination this weekend. My drive today wasn't far as I was stopping in Quartzsite for the night two hours south to meet Pam and Russ. Their trailer is just over the roof of my car. 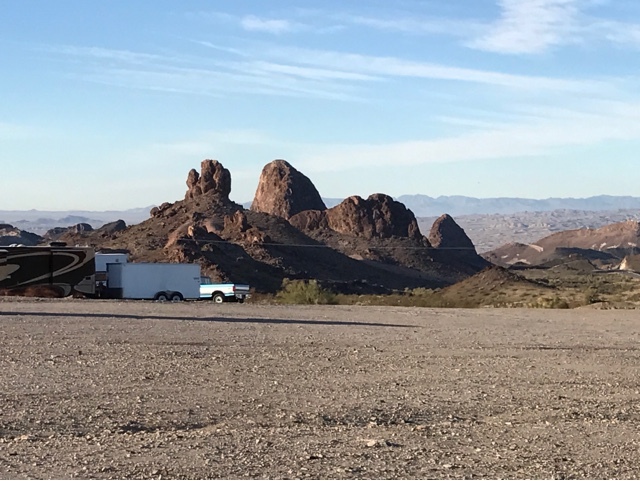 I got to know Pam and Russ through a mutual vandweller friend, and although they have lots of experience traveling and camping they were not familial with the Quartzsite area. Since this is the first time in the area I had given them information before they got here a few days ago. As I was away up north this would be the first time we actually meet. All I can say is what a nice couple and how they were very social and gracious in inviting me to lunch and dinner. I enjoy meeting new people so it was fun to listen to their experiences too. They volunteer at Glacier National Park in Montana for the summer, a place I would like to visit. 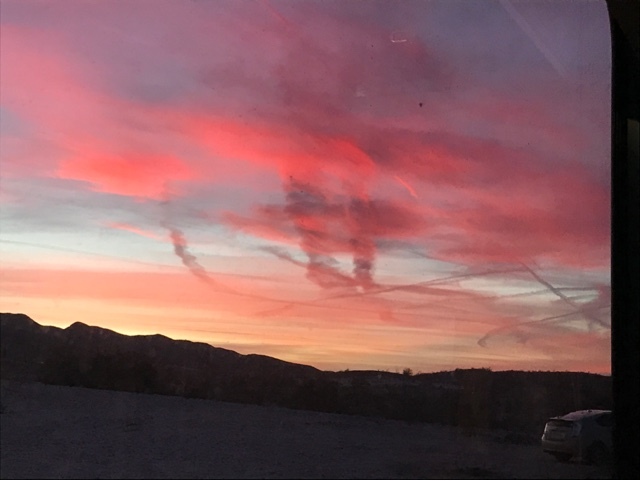 Above was our sunset last night from Pam & Russ' dinning area in their trailer eating dinner. You can't ask for a better view! Good morning Brent! True to your word, you are an early riser and slip out! It was a pleasure meeting you. I hope our roads will cross again!